Are you, or someone you know, struggling with the pain of divorce? Would you like to talk about it with folks who have been through what you have in an attempt to find hope and healing? 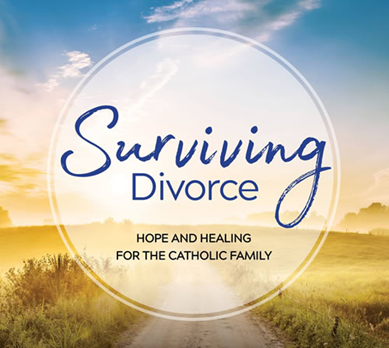 The Surviving Divorce program is a proven program that works to bring that very thing to those in need, through the teachings and the sacraments of the Catholic Church. This unique 15-week divorce recovery ministry is designed to compassionately address concerns of divorced or separated Catholics, supported along the way by folks who have been through it themselves. The emphasis on prayer, scripture, and the teachings of the Catholic Church is designed to lead to healing and a deeper relationship with Jesus Christ. The 15-week sessions of the program are held at St. Joseph Parish in the Maloney Room of Flaget Hall, 110 North Fifth St., Bardstown, KY on selected Thursdays from 7:00 PM to 9:00 PM weekly. The cost for the program is $50, which includes all materials, text and workbooks. If needed, financial assistance is available. A promotional flyer for the program is available HERE to advertise the current sessions of the program in parishes or other locations. Further information is available by emailing the Archdiocese of Louisville’s Family Ministries Office at family@archlou.org or by calling 502-349-2922 as well as by visiting the program’s website HERE.